The importance of Political Activity to our Brothers and Sisters in Public Safety cannot be overstated. Every contract, consolidation, shared services agreement, policy, procedure, worker protections, and discipline matter comes down to political action. The future of California and the Labor Movement hang in the balance. Please ensure your members, friends, family, and neighbors all support pro-labor, pro-public safety candidates and that they are registered to VOTE via Absentee Ballot or in person on November 6th, 2018. 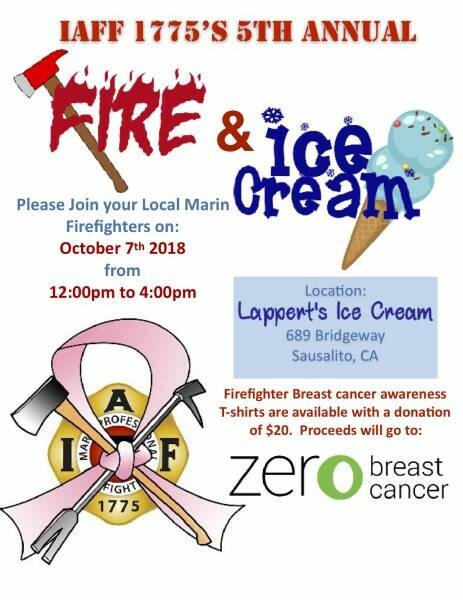 Marin Firefighters will host the annual "Fire and Ice Cream" October 7, 2018 at Lappert's Ice Cream in Sausalito. This event is part of our October Breast Cancer Awareness in which we raise donations for Zero Breast Cancer located in Marin. Please come down and have some ice cream at Lappert's! October 9, 2017, a wind driven firestorm enveloped dozens of communities in Sonoma and Napa counties, California. Scores of homes were destroyed, and as of October 10, the fires are still largely uncontained, threatening thousands more. 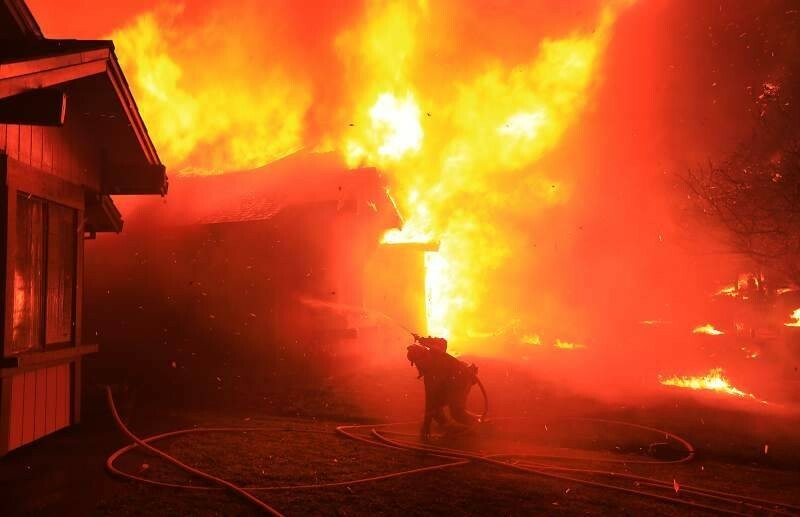 As firefighters risk their lives working to protect civilians, many have learned that their homes were consumed as well. This fund, managed by Marin Professional Firefighters, IAFF Local 1775 (www.iaff1775.org) is the official fundraising platform to assist firefighters and their families who've lost their homes. Funds raised here will be distributed equally among those in need - currently at least 40 firefighter families affected from IAFF Locals 1401 (Santa Rosa Firefighters), 1775 (Marin Professional Firefighters), 55 (Oakland Firefighters), 798 (San Francisco Firefighters), 1415 (Petaluma Firefighters), and several other smaller agencies and locals. San Anselmo, CA. August 3, 2017. 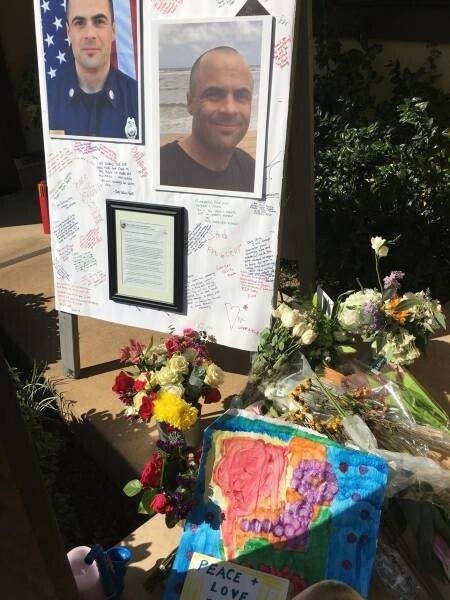 It is with profound sorrow that Ross Valley Fire Department announces the unexpected passing of Ross Valley Fire Department Engineer/Paramedic Chris Mahoney, age 39. 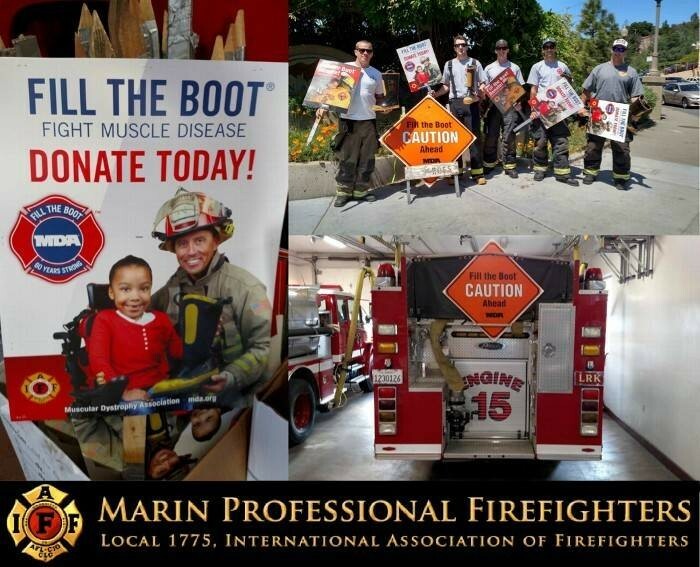 Marin firefighters will "Fill The Boot" for MDA April 14, 20, 22, and 23! Help us help local families fighting neuromuscular disease! You can drop a donation into our boots at any one of our other roadside locations. We need your help to break our record and help more families than ever in 2017! LOCATIONS & DATESFRIDAY, APRIL 14TH 8AM-1PMSAN RAFAEL: Grand Ave. at 2nd & 3rd Street!THURSDAY, APRIL 20 8AM-1PMSAN ANSELMO: Sir Francis Drake Blvd. at the Hub!SATURDAY, APRIL 22 9AM-2PMNOVATO: Rowland Blvd & Vintage Way!SUNDAY, APRIL 23 9AM-2PMTIBURON: Tiburon Blvd at Main Street!SAUSALITO: Bridgeway at Princess Street!